My cell phone alarm went off at 6:30am, though I had actually been up already. It was time to start the packing process before breakfast. At this point it’s down to an art, if you’ve already read my packing blog for this trip you’ll know I used 6 of the Eagle Creek small cubes which fit exactly into my PacSafe 45L duffel. Tops go into the tops cube, bottoms into the bottoms cube, bath stuff into the bath cube and so forth. I don’t actually ever unpack. I more just set the cubes on the shelves and open them up for easy access. It’s like having a set of drawers. Since I’m living out of a suitcase for 6 weeks or so, nothing I brought wrinkles which helps. The breakfast was as delightful as it was yesterday, the homemade bread with homemade apple jam still lingers in my mouth as I write this. Like yesterday my goal was to gorge myself with as much food as possible to avoid having to buy lunch. The only downside to this besides the obvious initial discomfort is that after multiple days, the belly expands, and the ability to preserve the food until dinner dwindles. The breakfast area was primarily full of business men in their suits and a few of us tourists, kind of an odd mixture. It was about 20 minute walk to the train station and then a 40 minute ride to the airport. Ivalo was a domestic flight, so my passport is still running under the radar. The flight was around 1.5 hours and in a commuter jet (jet not prop so that was good). One of the flight check-in ladies was pulling people aside for too large of bags and I knew I didn’t want to check mine and it wasn’t small, so I snuck to the other lady and got it on, which was lovely and fit just fine. Yay for duffle bags. The skies were calm and blue today with a layer of cloud below us the entire journey until our decent. I’m sure there was some cool scenery below us, maybe we’ll get to see it on the way back. When we landed I realized, it is official, I am currently within the bounds of the Arctic Circle! It starts at 65 degrees latitude and although I’ve been to Alaska and northern Canada, I haven’t crossed this threshold, until today. That’s not counting my polar flight from New York to Beijing and back nor my pseudo-polar flight from New York to Tokyo and back. Which by the way, the Beijing flight gave me the most incredible unobstructed views of the North Pole. Completely covered in snow (it was October last year) and mountainous, like snow covered mountains everywhere. I guess I always thought it was flat looking at the flat map of the white blob for so many years, but it is not flat, it is white, but not flat. As the plane descended into the tiny airport of Ivalo, the ground was red and Mars, much like the Big Island of Hawaii, but red instead of black and pine trees in the backdrop instead of palm trees. Turns out the red is from a Merlot colored moss-like plant that hugs the ground ever so tightly. We were the only airplane at the airport, there literally was not another aircraft in site. As the only plane it only made sense to pull right up to the front doors, drop the stairs and call it good. Like front row seats to a concert. Only half the plane got off, because it was like a bus that was just making a stop as others were on to random cities across the baron Lapland. The hotel shuttle was waiting with a lovely sign. I was the only one that didn’t check luggage (it’s against my religion, well practically) so while the others waited for their bags I grabbed a lox sandwich at the little café and a thing of ramen noodles in case I got hungry later. The bus filled with couple after couple after couple. Clearly this was a couple’s destination. Truthfully, I hadn’t planned to do this part solo. I had planned for my boyfriend at the time of planning this to join me, though at first he said he didn’t have vacation time, but then wanted to plan a week trip in November, then it was he didn’t have the cash, but after I offered to pay, there was just another excuse until it became clear he had no desire to go and couldn’t put aside his lack of interest for how important it was for me. I guess that’s part of why he’s an ex-boyfriend. All in all given where things landed, it’s probably a good thing it didn’t work out for him to come. The resort was a little under an hour north of the airport and about halfway through we came upon a herd of reindeer. Yes reindeer!!!! I felt like I was in a movie, their white fluffiness like mammoth rugged deer made for Arctic climates. So beautiful and clearly not bothered by the cars and their horns trying to get passed the herd that so gracefully meandered on the freeway. I knew this was going to be an awesome excursion. 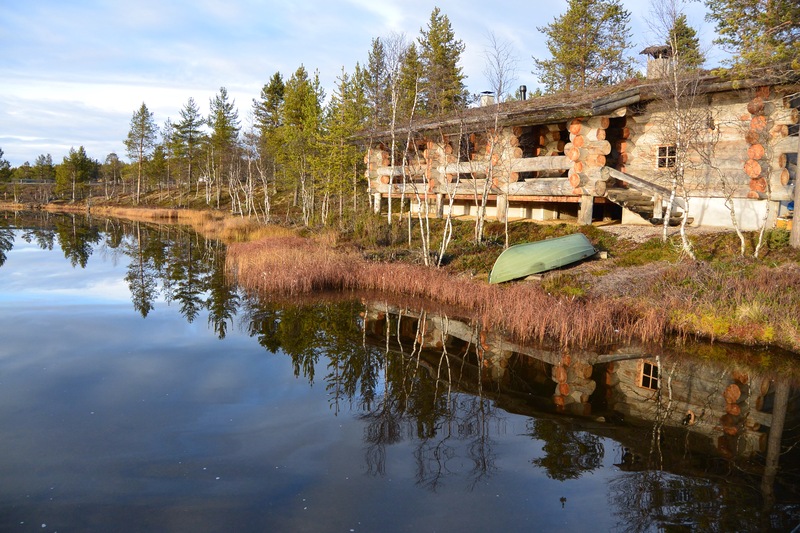 When we pulled into the Kakslauttanen resort and though the curb appeal could definitely use some work, I’m sure if there was snow everywhere it would have looked magical. We were giddy like school kids waiting to see our igloos! Inside the reception at check-in felt a bit like a kitschy mountain town store like the ones you’d find in Aspen or Breckenridge. Instead we were in Lapland which is in the kp2 scale for seeing the northern lights. What does that mean? Well the best place is kp0, but that’s like the North Pole, and then it works it’s way down, meaning it has to be even stronger to be seen in kp1 then kp2 etc. As an example, Iceland is a kp3, meaning I should have a slightly better chance of seeing them here. It’s a 15 minute walk from the reception lodge to the glass igloo which are through the woods and around the lake across a log bridge with nothing around. Pure solitude. They provide flashlights for the walk back after dinner, which is a set time from 6p-8p with a set menu (included in the price as there’s no other options around). The igloos admittedly are very basic. There is no wifi, there is no shower, there is only a bed with pillows and a toilet and sink. There is no clock, no knick knacks, no wall hanging, literally nothing but curtains. Although at first it feels a bit rustic, there’s something nice about it’s simplicity, but mostly about the fact that you literally can hear nothing. It might be the only time in my life I’ve heard this much silence. Like a stillness I’ve never felt before. There’s something magical about it, something romantic and peaceful. So you might ask, if there’s no shower how on earth do we shower. They have a special lodge with a sauna room (real wood burning stove! ), showers, changing area, and hair dryers. Everything you need but nothing more. This is definitely a no-frills resort, but in some ways it fits the experience. Admittedly, my imagination does go a bit wild here in that if they only invested $50K more, which really isn’t much, they could add just a few more creature comforts to attract even more revenue. The consultant in me is never off the clock I guess – ha! It has all the foundation for the perfect luxury experience IF they did just a little fine tuning. Though the basic feel certainly keeps the price down allowing for more people to have the experience. The lodge for example is only 80 Euro a night (the igloos are about twice that). It includes an enormous breakfast buffet that you can certainly fill up on and if you time it right could tide you over until dinner, which is also included in the price. They have a list of activities that you can purchase – visit the husky farm to meet the puppies, hiking with the husky dogs, horse back riding, fishing, gold panning, river rafting, hunting for the northern lights via horse carriage or quad bike, and so forth. The winter activities switch to include skiing, snowmobiling, husky sleds, etc. The best time to visit per the lodge is March. The property has pine trees all around, the kind that are tall and skinny where the branches are separated a foot apart like those plastic Christmas trees you get from K-mart. Who would have thought those were authentic for the Arctic. There’s a river that runs through the property and pools into a lake in front of the lodge. The water is so clear and so still it creates a perfect reflection of the clouds and sky. Most of the property is cabins scattered around, there are about 20 glass igloos, suites, chalet igloos (these are the top, perfect for a romantic getaway!). The igloos are the ones with glass ceilings to stare at the stars and hopefully northern lights from the comfort and warmth of your bed. Luckily there are northern light forecasts online and tonight is slated at a kp2, meaning if the clouds clear we would be the last boundary to see them if we see them. Fingers crossed! Being in the middle of no where there is plenty of time for self reflection, reading, walking around, or just meditating in the solitude. I elected to catch up a bit on writing and texting, then found their library of free books. Oddly enough a number of them were on couples and bettering your marriage…hmm…Admittedly I did poke around a bit on a few of them, always looking for tips to happy relationships. Though settled on The Heretics by Will Storr. Fascinating read, he’s clearly an analytical type and good at articulating. I love his direct bluntness when he recounts his interview questions. I have to wonder if he’s also an INTJ – haha! Needless to say it’s been a great read so far and we’ll see if I can get through the whole book before it’s time to go. I buried myself deep on the hand carved wood chairs with sheep skins draped across in the room where no one else was and I could sit in complete silence and just read. Before I knew it hours had passed by and it was already dinner time. For simplicity they serve one set menu option each night. It’s what everyone eats. Obviously if there’s an allergy or something they’ll adjust, but otherwise, it’s all the same. What a great way to cut costs and optimize the experience. Much like domestic travel on Asian airlines where your only choice is orange juice or water, but everyone gets the same meal or no meal. When you’re in a remote place and getting supplies is difficult and you want to minimize waste, this is pure brilliance. So what did we have? Well we all started with cream of mushroom soup and it was clearly homemade and delicious. For the main we had reindeer, maybe one of the ones we saw earlier, just kidding, paired with mashed potatoes, lignin berries, and pickles. I love how they put pickles with everything. I’m probably the only American at breakfast that paired pickles with my scrambled eggs, but man, I love picked stuff. For dessert we had ice cream with raspberry sauce. The section of the lodge where the dining hall is has a giant fireplace burning in the corner and three levels separated by brick stairs with wood beams and stuffed animals (birds, moose, etc.) hanging on the walls. It feels like a cabin, a warm, home-like cabin where you could nestle in for the night. Down the stairs is a bar area where the night comes to life and the various tourists from all walks of life join together in playing the piano, chatting, playing board games, or just enjoying each other’s company. There’s a bar stocked with various alcohols and a cellar stocked with wines. It doesn’t take long for this place to grow on you and it’s simple charm to feel inviting and comforting. I love Your post and especially Your description about how You see and Your travel experience. I am a little bit sad that You visited my country at “wrong” season. When travelling by plane man miss many nice things. Also if You would have read my blog before traveling to Finland, most probably You would have more ideas, more experiences. For example, I show places quite near to Ivalo which man can easily to reach by bus, but to rent a car would be ideal. Beyond the Arctic Circle 4.